A dental crown is a tooth-shaped “cap” that is used to cover a tooth completely to restore its strength, function and improve its appearance. It can be made from gold, stainless steel, porcelain, porcelain fused to metal or acrylic resin. Reasons for covering a tooth with a crown include ; a fractured tooth, a discolored tooth, tooth wear, extensive tooth decay, an existing large faulty tooth filling and after a root filling. A crown can also be put on a tooth as part of a bridge, to help retain the bridge. The dentist will introduce himself to you, explain the procedure and the reason for the procedure. The procedure usually requires multiple visits, a temporary crown (usually made from acrylic resin) is used prior to the permanent crown. At the first visit, the teeth to be crowned will have to be numbed (anesthesized) and prepared, after which the temporary crown is placed. 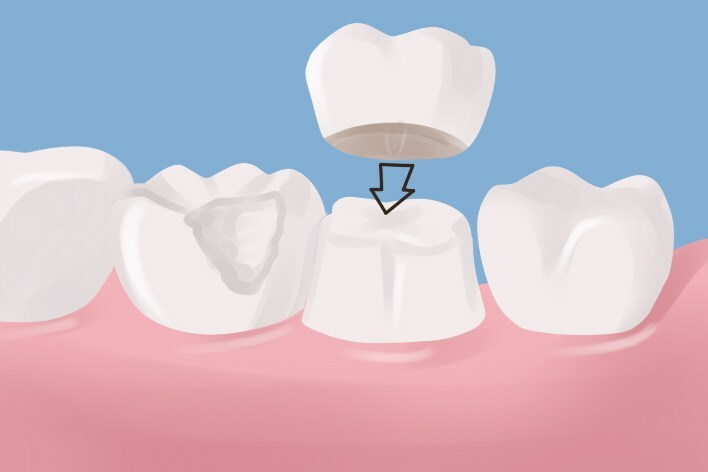 The tooth is prepared by reducing it in size so that the crown fits over it. You may experience a little discomfort after the fitting of the crown but that will disappear with time as you become accustomed to it. Avoid chewing on hard substances such as ice. With proper oral hygiene and regular visits to your dentist, many crowns will last between 15 and 20 years. We would like you to be as comfortable as possible through this experience. If you have any questions, do not hesitate to contact the clinic or your dentist directly. This entry was posted in Patient education and tagged implant, lecture.